September has been one of the most difficult months of my life, but I still wanted to share my favourites from this month! I was hoping to put up a post on packing makeup for travel, but that’ll be up soon enough! Because this month has been very hectic for me I’ve kept everything very minimal & I hope you enjoy! 1. Rimmel Wake Me Up Foundation (£8.99 via Boots) – Finally the weather is cool enough to wear foundations again! I love my ultra-light Bourjois CC cream, but I did miss my Rimmel foundation favourite – good medium coverage and easy to apply with a very subtle glow. I never thought I’d like this having oily skin, but it wears well over a primer and the illuminating effect it gives is never over-the-top. A perfect easy, everyday base for all skin types. 2. Basin Pink Sugar Body Butter ($16.99 via Basin) – I really wish Basin products were sold in the UK – everything smells divine and does wonders for your skin! These body butters are seriously the best I’ve ever tried – a super-lightweight whipped formula with a selection of gorgeous scents, which sink in fast with no greasy residue. I’m not a fan of The Body Shop butters, they’re far too sticky and greasy for me. Containing generous amounts of cocoa butter, coconut oil and shea butter, your skin will feel baby soft afterwards. The ‘Pink Sugar’ collection smells of candyfloss and as much as I’d love to bring the scrub and other products home with me on my trip soon, they’d be a bit too heavy to take with me unfortunately! 3. MAC Lip Conditioner (£11.50 via MAC Cosmetics) – Nuxe Reve de Miel is my ultimate go-to lip balm, but the pot definitely isn’t the most hygienic to use when travelling. This has been ideal when I’m out and my lips feel a bit dry – the almond oil and shea butter formula feels wonderfully hydrating on my lips too – most lip balms just dry my lips out even more. This little squeeze tube will be invaluable when I’m away next month! 4. E.L.F. Zit Zapper (£1.95 via E.L.F.) 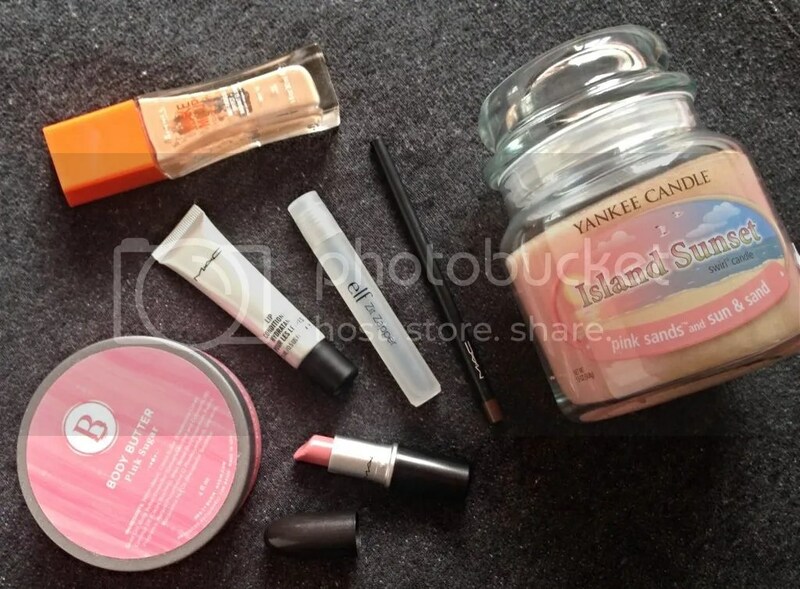 – Although products from ELF are brilliant for the price, I don’t seem to use them much! But I’ve yet to find a substitute for this incredibly useful little tool – a tiny roll-on for spots. I’ve been having the worst hormonal acne around my jaw and chin, and this really does speed up the healing process. Just apply the little roller on the affected area and leave overnight – usually they will be hugely improved the next day. The salicylic acid formula does wonders for even the most troublesome of spots, and you can’t beat that price. 5. MAC Brow Pencil in Lingering (£13.50 via MAC Cosmetics) – I thought I was happy enough with my Collection Brow Definer, but then I picked this up to buy with my latest Beales voucher (their rewards card is excellent) and discovered that it’s so much better than any other brow product I’ve tried before. The shade Lingering is a perfect match for those with naturally dark blonde to light brown brows – it’s so hard to find a decent colour match for my hair colour. The ultra-fine tip of this propelling pencil is ideal for drawing in subtle brow hairs to build up sparse areas without looking obviously drawn-on. I go over the top of this with my MAC Brow Set in Beguile for perfect, defined eyebrows – you’d never guess how light and non-existent my natural ones are! 6. MAC Lipstick in Creme Cup (£15.50 via MAC Cosmetics) – Yep, still on my MAC kick as you can tell! I’ve recently had my hair dyed a dark purple shade with hints of red, meaning I can now get away with wearing certain lip colours I couldn’t before..it’s the little pleasures in life! Creme Cup is my favourite pale pink shade in the creamy, comfortable and generally lovely Cremesheen formula – a bit too pink to wear with a bare face due to my redness, but just right for wearing with a full face. One of those cult favourites that suit almost anyone – it complements my darker hair well (I look so Alex Vause in this!) and have been wearing it more than any other shades in my vast collection this month. 7. Yankee Candle Island Sunset Swirl Medium Jar Candle (£16.99 via Yankee Candle UK) – I’m normally a Bath and Body Works candle addict, but after finding myself in a Yankee Candle store recently I couldn’t leave without buying something! I’ve been wanting their Pink Sands candle for a while, however the smaller sizes were sold out and I couldn’t quite justify the steep price of the larger jars. I actually spotted this unique swirl candle on sale for £12.49 – Pink Sands mixed with the Sun & Sand frangrance, which smelled gorgeous. Pink Sands is described as a blend of bright citrus, sweet florals and spicy vanilla (ie. divine), and Sun & Sand pretty much smells like sunscreen and the beach! Swirled together, this is the ideal end-of-summer fragrance, reminding you of a dreamy tropical beach holiday. On my second burn, this started to give off an excellent throw (it barely smelled at all the first time) and burns evenly. More Yankee Candles in the near future, I think! That’s it for my September Favourites! I’m sure October will be a much better month for me – September has definitely been a rough one. I hope you have had a wonderful month – let me know what you’ve been loving this month! ← A Primark Travel Haul!